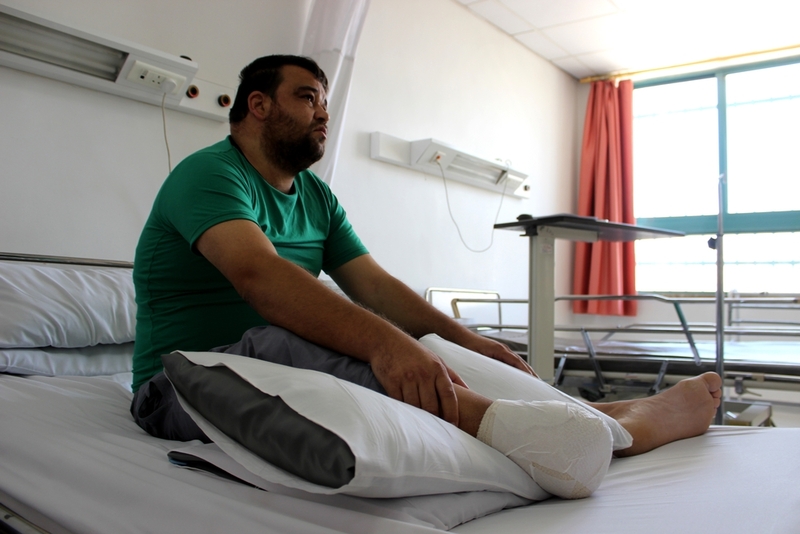 Patients and staff from the Doctors Without Borders/Médecins Sans Frontières (MSF) Hospital for Reconstructive Surgery in Jordan tell their stories in their own words. 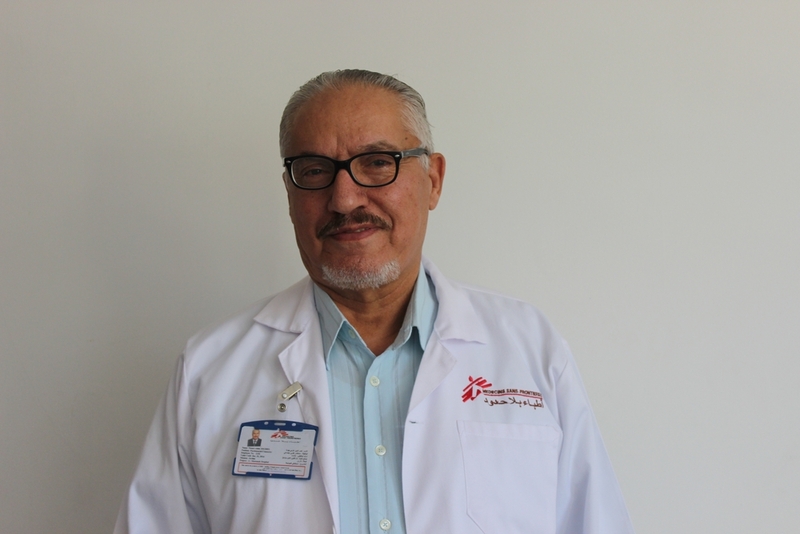 Dr. Nasr Al Deen Al Omari, psychosocial counselor at MSF's Reconstructive Surgery Hospital: "We provide mental health care for those deprived of their basic health care rights, while they are the most in need." I started working with MSF four years ago as a psychosocial counselor. I brought with me a wealth of experience exceeding 30 years of work in that field, that involved many different sectors. I am grateful to have had the chance to work for MSF’s reconstructive surgery hospital, because it enables me to perform my duty of providing humanitarian aid. I will give you a brief glance about the nature of my role, and what makes the mental health services in this hospital so essential. We are in the midst of action, even though it is happening elsewhere. Our patients are mainly the casualties of war happening in their countries, like Iraq, Syria, Yemen, and Palestine; our aim is to bring back mental health stability to their lives, and help them re-assimilate with their communities, both throughout and after treatment. They suffered severe trauma caused by the violent events they witnessed, which led to the loss of their loved ones, or destruction of their property, or eviction and displacement. So it is extremely important to understand what they have been through, in order to plan for a treatment that suits their situation, and the nature of their suffering. Our patients are but a few cases of so many out there, who suffered traumas as a result of the events they witnessed. Our team consists of four social psychologists, and we deal with cases from all age groups targeted by the project, where each of us specializes in a certain age group, to provide the best possible mental health support services. We have a specialist to deal with child cases, and a specialist to deal with women cases, while I deal with elderly men cases. We do, however, run joint activities, especially entertainment and social interaction events. We deal with approximately 20 cases a week in total. Each and every case I dealt with has had a deep impact on me personally, but given the nature of our work, and in respect of our professional values, I cannot share any details of these stories outside of work. I can, however, speak generally of the violent events those people had to go through, and what difficult and horrifying circumstances they had to live with during the war. For example, there is one case that I can still remember quite clearly, about a patient who was tortured in prison only a few hours after being wounded. He was deprived of the most basic health care services, and was subjected to extreme torture, at a time where he was still bleeding. A few days later, his wound got rotten and extremely infected, which led to the need of an amputation surgery later. I cannot forget when he spoke to me with tears in his eyes. He was treated so inhumanely. It is still a great pleasure to work with those people though, as we can witness improvements in their mental health condition, which has a great positive effect on their treatment. I wish the day will come where we will stop having such cases, where all conflicts in this region stop, and the mental and physical casualties stop with it. Hassan Abu Hatab, caretaker at MSF Reconstructive Surgery Hospital: "We attend for the tiniest details of our patients around the clock." I am Hassan Abu Hatab. 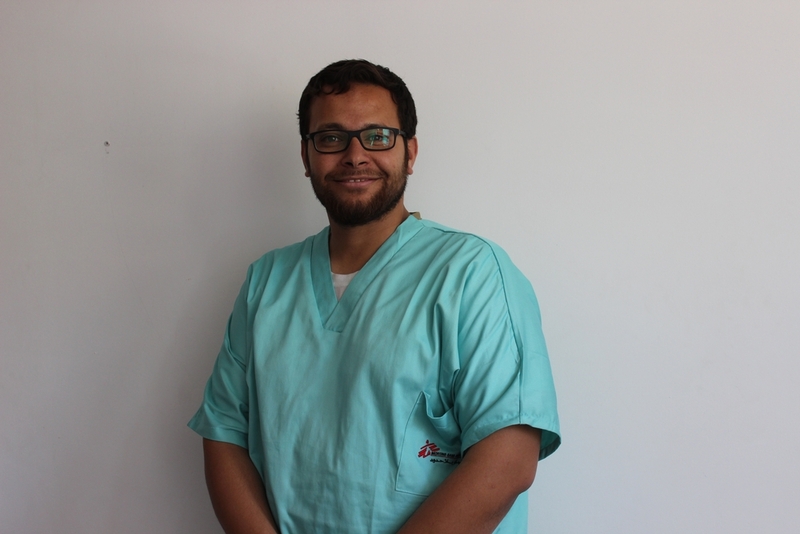 I am 28 years old and I work as a caretaker in MSF’s reconstructive surgery hospital. Most people have no idea what a caretaker in MSF does, and the simplest way to describe it is attending to the tiniest daily details of our patients, spending a long time with them around the day, and even at night during shifts. My part is to follow up [on] the medical needs of patients, completing what the medical staff in the project has already done, so we provide them with daily meals, and give them their prescribed medicines. We also care for their different needs of hygiene and sterilization, and this is an important and delicate side in our job, especially because so many war-wounded suffer antibiotic-resistant infections. We give our patients all the time they need to talk about the difficulties they have been through in their countries, and the longing they have for their houses, families, and homelands. And we often work as a link between them and the psychosocial support team inside the hospital. We see the patients every day, and spend more time with them than the time we spend with our families, so we fully understand their needs and their ups and downs during the long process of recovery in MSF’s reconstructive surgery hospital. The ultimate aspect of the project is not only the surgical care it provides, but the sense of humanity that motivates every staff member to apply the highest human standards in serving the patients, regardless to whether a surgeon, a physiatrist [physical medicine and rehabilitation physician], a nurse, or a caretaker, as we all comprehend the suffering those wounded have been through because of the many regional wars. Every case I worked over the past years has pushed me to continue my work with MSF, but one of the most memorable patients was a Syrian child called Orjouan who was three years old. [She] lost her mother and brothers in the Syrian war, and also lost her childhood because of the severe burns and fractures she had. She was calling every woman she saw "Mum" because she was missing her mother so much. Orjouan is just one of the hundred cases we deal with on a daily basis. And, in fact, working with children is particularly pleasant, especially when we encourage them to eat their meals, or give them paper and colors to draw and paint, because we can clearly see the innocent smile on their faces that defies war and its calamities. 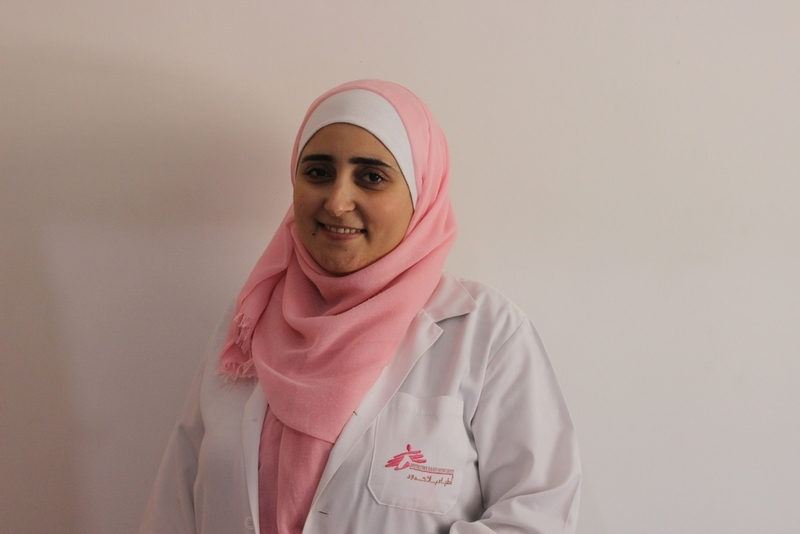 Amani Al Buhisi, health education nurse at MSF Reconstructive Surgery Hospital: "The hospital is a second home for patients, and we work to make this home the best place for them away from their war-torn countries." I started working with MSF three years ago as a health education nurse, specializing in reconstructive surgery for victims of war. Health education activities focus on four aspects: personal hygiene, infection control, nutrition, and smoking, which is dangerously affecting the treatment process. We offer health education services in the inpatient and outpatient departments, and I work with an important and specific group of patients and war-wounded children. This group of patients requires special care as they are coming from some very complicated contexts of destructive wars, and thus most of them were deprived of the basic knowledge of personal hygiene and other health educational issues. So we need to adopt awareness-raising strategies that meet their age level, and make it easier for them to get the information in simplified ways, like using their favorite cartoon characters or certain games or toys to facilitate knowledge concerning personal hygiene. We also talk about healthy practices through group sessions where they perform teeth brushing and hand washing. One of the major challenges in educating children is dealing with the traumas they had and still live through after all the tragic events they have witnessed in their devastated countries, so it’s crucial to use creative techniques every day to encourage them to accept information and apply them. MSF’s specialized project in reconstructive surgery requires a long period of hospitalization, and many patients need multiple treatment phases. We focus on the idea that the hospital is a second home for patients, and we work to make this home the best place for them away from their war-torn countries, in addition to ensuring the hygienic environment they live in, and giving them the health care they need between the different stages of treatment. We also train fathers and mothers or caretakers in general on how to attend to the details in caring for their children. Many patients reach the hospital suffering severe infections due to the injuries they had in their countries, and high levels of resistance to the different antibiotics. What makes this project special is the joint efforts all departments exert towards the one goal of offering high quality medical care for patients. My work with MSF is a turning point in my career because of the human aspect of the project. This has pushed me to develop health awareness approaches, and to use the experience I obtained through this project to create a transition for the individual after me. Nora Abdullah, 28, from Gaza, Palestine: "The Gaza war taught us that the price of preparing a breakfast meal can prove to be very costly; we are surrounded by danger every single second." I arrived in Jordan for the first time at the end of September last year, and I had to undergo nine surgeries. My injuries were quite severe, especially in the face and jaw area, which was caused by a bomb explosion in my house in Beit Lahiya. I can still remember every single detail of the incident. It was around 9:00 a.m., on the second day of Eid al-Fitr in 2014, during the Gaza war. I was preparing breakfast in the kitchen, and all of a sudden, a shell came through the window and exploded. My husband died immediately, and I was severely injured in my lower jaw. Luckily, none of my three daughters were hurt, as the explosion was far from their room. My husband died in his bed, and the emergency team could not do anything to save his life. I was taken to Al Shifaa hospital in Gaza, where I had to undergo a few surgeries, including skin grafts and clearing splinters off my body. This treatment lasted for over a month, before I was transferred to Egypt to continue treatment. I had to undergo three surgeries in Egypt; my face and lower jaw were severely damaged, and I needed more specialized care, so I decided to go back to Gaza, in order to be closer to my family. We waited for a year, before we got an approval to travel to Jordan. We had applied for treatment at MSF’s surgical hospital, and luckily I was able to travel to Jordan with my father. We arrived there after a long and tiresome journey, but it was worth it. After the surgeries were done, my lower jaw movement got much better, and my ability to talk and eat improved so much. I am very happy that this phase of treatment is over, and I can go back to my family in a few weeks. Erfan Amari, 35, Daraa, Syria: "The war in Syria did not leave us much hope." I had a severe leg injury caused by a shell that was dropped on my village in Daraa. It happened towards the end of 2012. I arrived to MSF’s surgical hospital in Amman, Jordan last month. My injury did not heal throughout the years following the incident, and I did not receive the proper medical attention I needed. My injury was caused by splinters, and my foot had to be amputated two years after the incident, due to a major infection that is still being treated now. I was hospitalized immediately at a field hospital in Syria, where the wound was surface-cleaned only. A few months later, I left for Jordan accompanied by my wife, and we headed to Al Zaatari Syrian Refugee Camp. My suffering continued there, which unfortunately led to my foot being amputated in 2014, due to being diagnosed with as a severe infection. I was expecting the pain to go away after the surgery, but I started to feel it again a few days later. I met a doctor from MSF during his visit to Al Zaatari Camp, and he told me about the possibility of having my case treated, and having the inflammation contained. I was approved for treatment at MSF’s surgical hospital early in June 2016. Once there, I started another treatment process. It began with a deep cleaning of the wound, and a treatment with antibiotics, which the bacteria was not resistant to. There is a possibility for another surgical intervention to contain the infection. The war in Syria did not leave us much hope; all I hope for is for my leg to be saved, so I can reunite with my family at Al Zaatari camp. The living circumstances there are extremely difficult, and they need me by their side.